John Jenkins Sneak Peak from the Chicago Show 2017! On display in the Treefrog Treasures room, under the guidance of Tom Dubel, was the prototype of the iconic second world war carrier fighter, the Vought F4U Corsair. The Vought F4U Corsair is an American fighter aircraft that saw service primarily in World War 2 and the Korean War. The Corsair was designed as a carrier based aircraft. Initially its difficulty in landing on carriers, rendered it unsuitable for Navy use until the Royal Navy overcame the landing issues. After the carrier landing issues had been tackled, it quickly became the most capable carrier based fighter bomber of the Second World War. 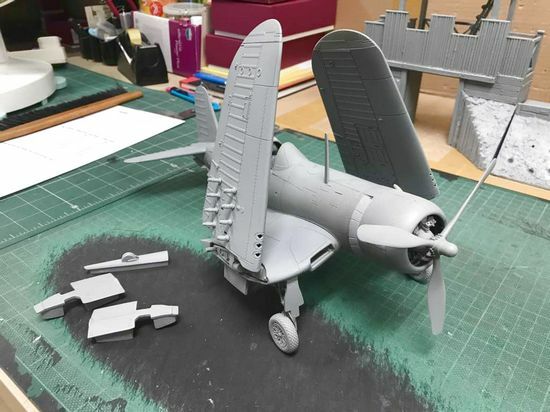 The jjDesigns Corsair, can be displayed with wings down, and sitting on two of the jjD BH aircraft carrier decks. The Undercarriage for the Corsair is interchangeable, and the model can be displayed on any of the jjD Flight Stands. The wings can also be plugged into the raised position. This with a single jjD Aircraft carrier base, allows for those with limited space to display their Corsair on a standard shelf unit. The first Corsair will be available in 2018. There will be another iconic US carrier plane released early next year, before the Corsair. 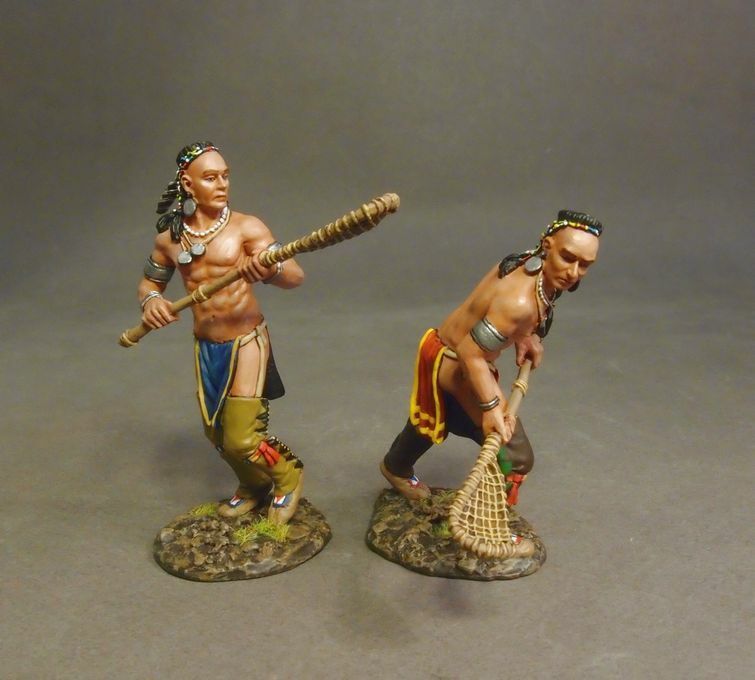 Captive-taking by Native Americans was surprisingly common in Colonial times. 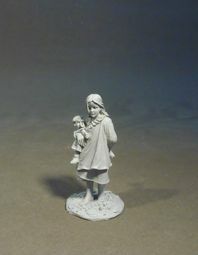 It was also common for captives to choose their Native communities over their Colonial families. This puzzled the European Americans.They came to America believing that conversion would be easy once Natives saw the superiority of the Europeans’ religion, clothing, agriculture, dwellings, and every comfort known so far to man. Amongst the many who were captured was Mary Jemison. A new series from jjDesigns, was previewed at the Sierra Toy Soldier room, at the Chicago Toy Soldier Show 2017. 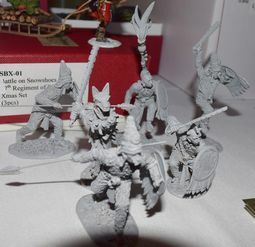 The first of the Aztec figures will be available in December. Please note the first of the Conquistadores will be previewed at the December London Toy Soldier show. Another new jjDesigns series for 2018, will move the eighteenth century work towards the American Revolution with the “Drums Along The Mohawk” series. Will be available early 2018. Primarily based on the book of Walter D. Edmonds who wrote about the area of upstate New York, and detailed the lives of pioneer farmers along the Mohawk River during the American Revolution. Edmonds also wrote “The Matchlock Gun,” which was about a 10-year-old boy defending his home against Indians in colonial New York, and won the Newbery Medal for Children’s Literature in 1942. He also wrote about four women captives of Indians in 1778 in his 1947 book “In the Hands of the Senecas,” Edmonds’ books are considered the richest body of fiction about the time and region since the works of James Fenimore Cooper. Turkish figures for the Gallipoli series. This included a two man machine gun team, an officer, as well as a Turkish sniper. The first of these sets should be available in the next few months. Billy Sing was an elite sniper from Australia and his “duel” with his opposite number from Turkey called Abdul the Terrible, became the basis of Ion Idriess book “Lurking Death; The Stories of Snipers in Gallipoli, Sinai and Palestine”. “Abdul the Sniper was the pride of the Turkish Army. They named his rifle ‘The Mother of Death’. Because, so declared the Ottoman Guard, ‘her breech gives birth to bullets which destroy the lives of men’,” Idriess wrote. One of the Turkish snipers victims was Private John Simpson Kirkpatrick, “the man with the donkey”. A party of “counter-snipers” led by Lieutenant Thomas Grace, Wellington Battalion NZEF, were briefed to take on the Turkish marksmen. 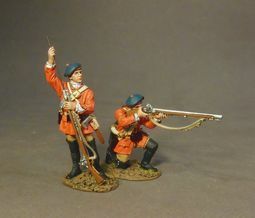 Each sharpshooter had an observer or spotter with a telescope. An equally terrible Australian sniper emerged who day by day killed man after man. The Australian sniper was trooper Billy Sing from Queensland of the 5th Light Horse. Abdul the Terrible was ordered to locate and kill him. Adbul the Terrible would apparently examine any man who was shot through the head to try to establish the trajectory of the bullet and the likely location of the sniper from whom it was fired. His calculations led him to believe the shots were coming from one spot nearly on top of a trench across on Chatham’s Post.At night Abdul began to dig his cunning fox hole into which he would climb before dawn to lay there all day, staring across at Chatham’s Post. The next day, according to the account, another Anzac climbed into Sing’s hideout or “possy” but instinct apparently told Abdul this wasn’t the real man he was after and he, accordingly, withheld his fire. Then Sing got into the possy and his observer suddenly alerted him not to open the loophole. Sing looked through the telescope. “Thus the Australian sniper stared into Abdul the Terrible’s eyes,” according to the text. “Careful,” murmured the observer. “He’s got the eyes of an eagle and – he’s staring straight here.” “It’s me or him,” grunted Sing. “That was what Abdul was waiting for. His big eyes staring, his rifle-muzzle slowly rising up… But Abdul did not know that the Australian sniper had seen him. The Australian War Memorial states that the Turkish army immediately retaliated, aiming its heavy artillery at Billy’s hiding position and completely destroying it. 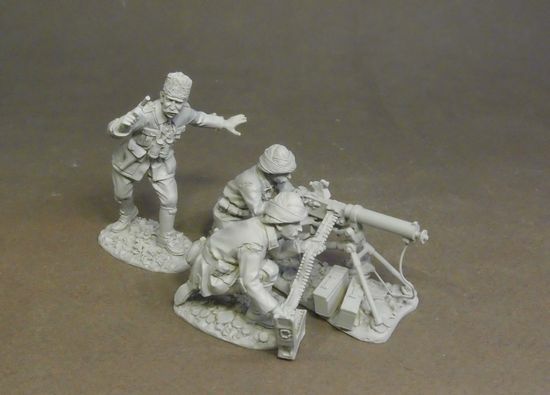 Fortunately for the Australian sniper and his spotter, they had already evacuated to their unit trenches. 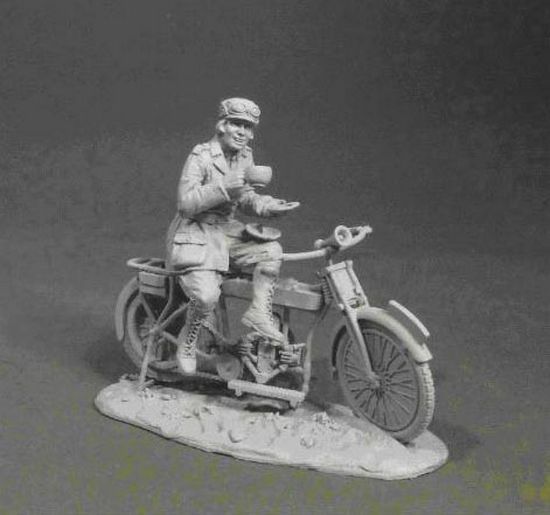 The Great War “Biker Girl”, will be available in October. The importance of motorbikes during the Great War is all too often overlooked. 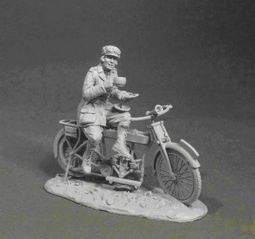 Motorbikes were used for mounted infantry, scouts, dispatch and courier duties, ammunition carriers, medical supply carriers and casualty evacuation. The versatility of these machines clearly helped them play a hugely significant role in the logistics of the war, far more than the automobile. The use that they were most commonly used for was that of the messenger. Because of the unreliability of communications technology during the war years, the motorbike’s virtue of speed meant that orders, reports and maps could be transferred between units quickly. It was not only the men who got to ride around on motorbikes. The Women’s Royal Air Force (WRAF) made extensive use of motorbikes. The initial aim of the WRAF was to provide female mechanics so that men could be free to serve in the armed forces. Thanks to the high number of women volunteers, many also filled driver positions as well. 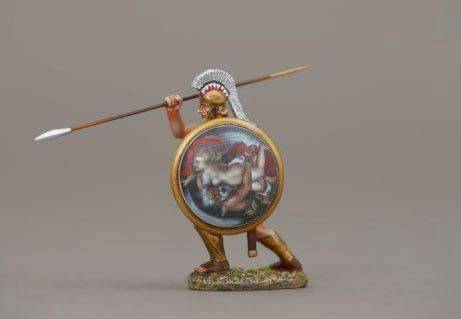 Spartacus was a Thracian gladiator. Little is known about his life before he became one of the slave leaders in the Third Servile War, which was the slave uprising war against the Roman Republic. Spartacus may have served in the Roman army, and it is generally believed he deserted, and led bandit raids. It is known he was captured and sold into slavery. In 73 BC he escaped from a gladiatorial training school at Capua along with about 70 other gladiators. Taking refuge on Mount Vesuvius, along with other runaway slaves who the gladiators trained in rudimentary combat skills. Spartacus it is believed became one of several leaders of the Gladiators’ revolt, along with two Gauls, Crixus and Oenamus. Initially Rome did not regard the slave army as a serious force and did not send first line troops against it. Spartacus’ army outmaneuvered and defeated the first four forces it confronted, which led to more slaves joining the rebellion, and at its peak the army was believed to have been 90,000-120,000 strong. Spartacus advocated crossing the Alps to put distance between the army and Rome and find freedom. One of the leaders, Crixus wanted to attack Rome itself where large numbers of slaves would also join them. This led to Crixus and 30,000 men leaving the main army to raid the countryside, who were eventually defeated and killed. Spartacus won 3 more engagements and then for unknown reasons turned south instead of crossing the Alps, which threw Rome into a panic. 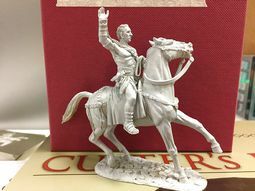 A new Roman force under a competent commander named Marcus Crassus was sent to deal with the rebellious slave army, and after a long period of pursuit and a few engagements, the slave army was defeated near the headwaters of the Siler River in southern Italy. Spartacus was killed, but his body was never found. The Romans crucified 6,000 rebellious slaves as a warning to others. The story of Spartacus has served as inspiration for books, movies and tv series. He has often been made into a symbol for oppressed people rebelling to overturn their society, although he actually never attempted to overthrow Roman society, but just tried to lead his army to safety and freedom. 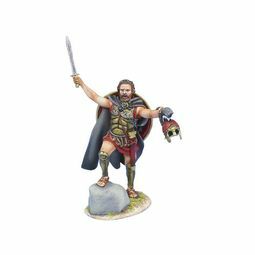 The Spartacus figure and more enemies of Rome will be available in 2018. The first three prototype pieces of the Roman/Barbarian fort. The Battle of Alesia or Siege of Alesia was a military engagement in the Gallic Wars that took place in September, 52 BC, around the Gallic oppidum (fortified settlement) of Alesia, a major centre of the Mandubii tribe. It was fought by the army of Julius Caesar against a confederation of Gallic tribes united under the leadership of Vercingetorix of the Arverni. It was the last major engagement between Gauls and Romans, and is considered one of Caesar’s greatest military achievements and a classic example of siege warfare and investment. The battle of Alesia marked the end of Gallic independence in France and Belgium. In AD 60, the ICENI of East Anglia who were led by the legendary Boudica, rebelled against Roman rule, and were defeated in a battle fought it is believed somewhere in the midlands. As a result of the rebellion the Romans built a series of fortifications in the area, which included Fort Lunt, near Coventry. The Fort Lunt was built around AD60 to act as a supply depot and headquarters for the Roman Army during the final campaign against Boudica. The Gateway has been inspired by the reconstructed Roman Gateway at Fort Lunt. Alesia was an oppidum (fortified settlement) on a lofty hill, with two rivers on two different sides. Due to such strong defensive features, Caesar decided on a siege to force surrender by starvation. Considering that about 80,000 men were garrisoned in Alesia, together with the local civilian population, this would not have taken long. Straight sections and corner sections will be available to produce a complete fort, or a suitable circumvallation defensive perimeter. The jjDesigns Roman Fort will provide the perfect backdrop to either a Boudica Rebellion, or a Siege of Alesia display. The Roman fort will be available early in 2018. New Thomas Gunn September Releases! 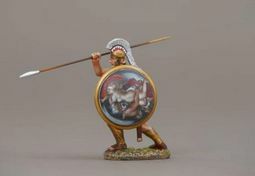 SPA019C Spartan warrior thrusting spear over shoulder (Spartan Lambda) – SPA019 Spartan warrior thrusting spear over shoulder, comes with 3 shield variants comprising Spartan Lambda (C version shield on box label ), Zeus with young girl (Q version shield on box label ) and finally a beautiful Mermaid with sailor rendition (R version shield on box label). ROM001DA Roman Legionnaire advancing with Pila lowered – ROM001D Roman Legionnaire advancing with Pila lowered: This time in a new variant but minus the trousers of the first version, has an additional water bottle strapped to sword scabbard and small bag attached to back of the Legionnaire for that added touch of detail. The water bottle is moveable and therefore can be moved behind the shield out of view if preferred. All unlimited so long as demand warrants production. Comes in 3 versions, red shield plus our normal 9th and 30th black shield Legions. ROM055 Praetorian Centurion – ROM055 Praetorian Centurion directing his Guardsmen, limited to 200 in number. ROM059A Roman General – Roman General receiving salute. Comes in 3 variants, the classic red shield, the 9th and the 30th Legion variants with black. The red shield variant is unlimited whereas the black shield variants are limited to 100 pieces worldwide. The figure can be displayed with or without shield depending on your preference. ROM063A Roman Aquilifer – Roman Aquilifer with new style eagle and wearing Bear skin. Unlimited so long as demand warrants. ROM063B Roman Signifier wearing Bear skin – Roman Signifier wearing Bear skin. Unmited so long as demand warrants it. Around 286 AD, Diocletian divided the Roman empire into four district administrative entities. The west had capital cities in Milan and Trier, with the east finally settling on Constantinople as its capital. When the Roman Empire in the west collapsed, the territory in the east continued for another thousand years until the fall of Constantinople to the Turks in 1453. Constantinople was a city designed for defence, it formed a triangular shape with 2 sides on water and the 3rd on the land side. Over time the city was considerably fortified and it withstood multiple sieges during its history, its walls once being breached by the 4th Crusaders in 1204 and then finally by the Turks as previously mentioned. The Romans in the east became popularly known as the Byzantines and were renowned for the beautiful artwork in their churches and opulent clothing. There was a strong tie with the Pope in Rome which worked for and also against the Byzantines. 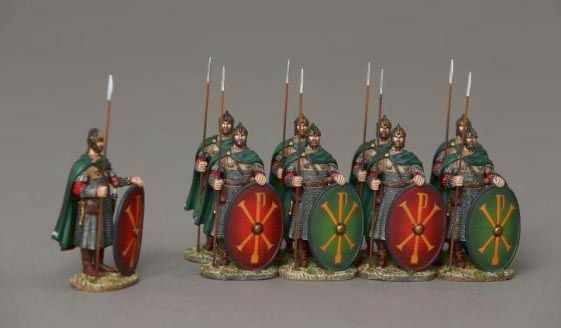 Our first 3 Byzantines will feature an imperial guardsman, Heraclius the Emperor who defeated the Persians at Nineveh and a Byzantine officer, all of these will be suitable for the 7th century era. 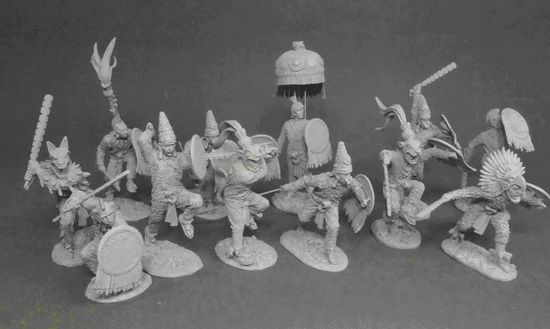 More Byzantines to follow later in the year as well as some Persians, as we expand this exciting offshoot range of our Romans. Unfortunately we only have the imperial guardsman available this month, but he sure does give a taste of things to come. 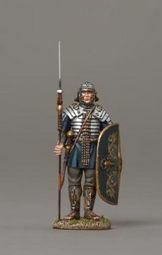 BYZ001A Imperial Guardsman with chi ro symbol (Red Shield) – This emblem is still seen as a popular Christian symbol to this day. Both the above limited to 100 pieces. ACCPACK004 Parachute Weapons and Accessories set – Parachute Weapons and Accessories set. Brimming with goodies this set comprises 2 x Sten Guns, 2 X Enfield Rifles, 2 different drop canisters, 2 x Webley pistols, 2 airborne style helmets, 1 x wicker basket with removable lid, 1 x Bren gun and 2 x mortar Containers. 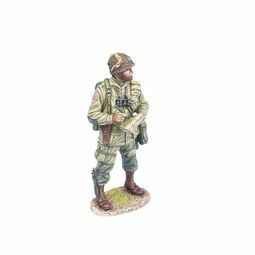 As you can see it looks great laid out as per a pre-drop inspection or can be dispersed around your battlefield diorama as you see fit. We have only made 100 pieces and this 14 piece set. New John Jenkins September Releases! 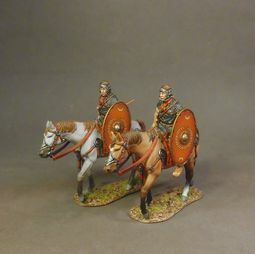 Roman Auxiliary Cavalry were drawn from a wide range of warlike peoples throughout the provinces, especially on the fringes of the empire. They were generally not citizens of the Roman empire. 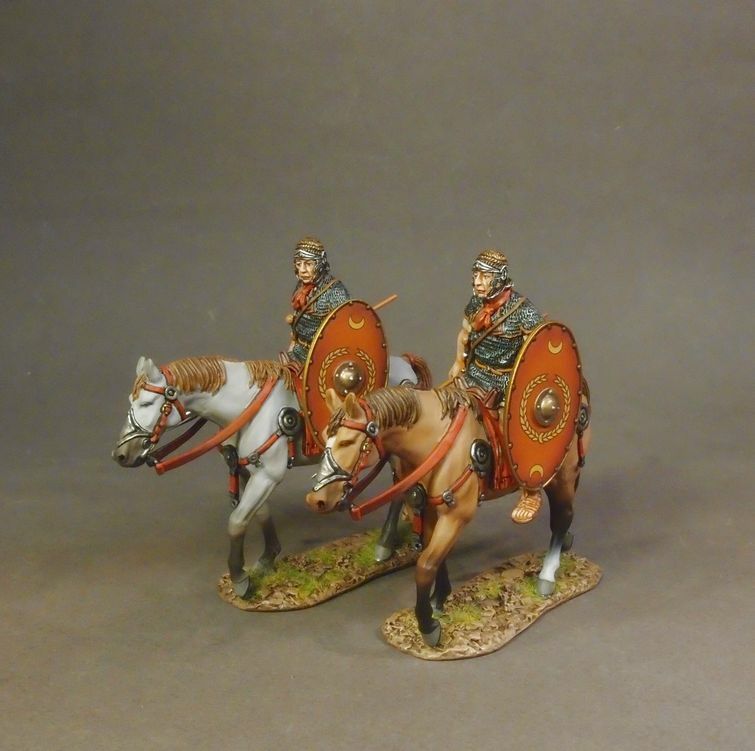 These auxilia cavalry provided a powerful fighting arm, they were well organized, disciplined, and well trained. The four horned saddle, which was originally of Celtic origin, was an important part of cavalry equipment. The four tall horns closed around and gripped the riders thighs, but did not inhibit free movement , which was especially important to spear armed horsemen. 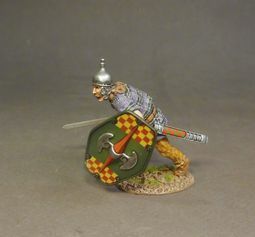 In an age which did not have the stirrup, the adoption of the four horned saddle allowed the horsemen to launch a missile effectively, or use both hands confidently to wield a shield and sword, during a melee. 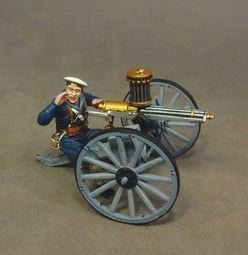 The Naval Brigade was a generic term used to define a body of Seamen, and Royal Marines, drawn from their ships and landed for active service under the orders of an army commander. Numbers were immaterial and it did not relate to an army Brigade. Often it would not even be of battalion strength. Generally the armament of the Naval Brigade was made up of what was available from the parent ships, from where the Brigade was drawn. The Gatling gun or its variants was the main weapon of the Naval Brigade in Egypt and the Sudan. The Aircraft carriers during the second World War mainly had wooden decks. It also depended on whether the ship received upgrades or had battle damage repairs. To better camouflage the carriers from the air, the decks were treated with a dark blue stain, called “Deck Stain #21”. It was approximately the same colour as the “Sea Blue” that the tops of the aircraft were painted during the tri colour scheme, but not as dark as the overall “midnight Blue” which aircraft were painted towards the end of the war. Please note “BH CARRIER BASES” can be used as single, double or as a triple display. The Double Base 19 ½” x 15” x ¾” (using any 2 of the 3 BH bases) can accommodate most 1/30 scale carrier fighters. The Triple Base 29 ¼” x 15” x ¾” (using any 3 of the BH bases) can accommodate one 1/30 scale carrier fighter and 1 “parked” carrier fighter. 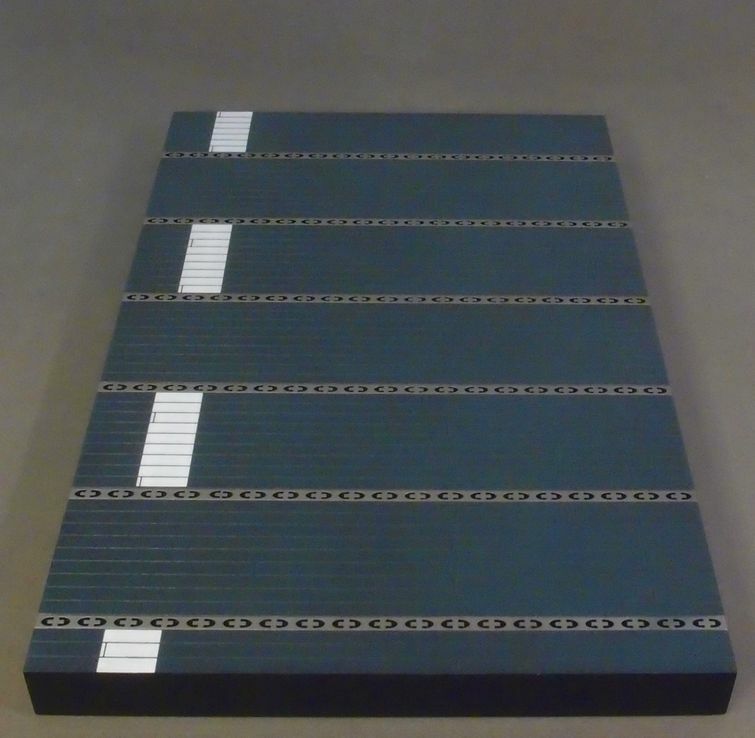 Please note BH Carrier Bases are designed to be displayed in sets of 3, “running Vertically”, as opposed to the IWA Carrier Bases which are designed to be displayed “running horizontally in sets of 2. 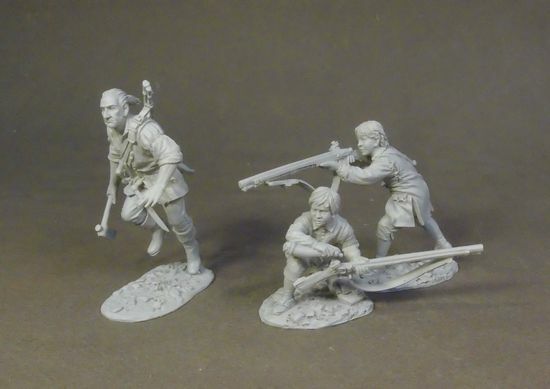 New King and Country September Releases! Perhaps so, with the addition of the final leading character of the ‘BLACKADDER GOES FORTH’ series that depicted, in very black humour, the absurdities and humour of the trenches in World War One. FW229 Lieutenant George – Lieutenant The Honorable George Colthurst St. Barleigh M.C. is a frontline Infantry Officer, second-in-command to Capt. Edmund Blackadder.In both manner and personality he is a very close relative to P.G. Woodehouse’s Bertie Wooster. 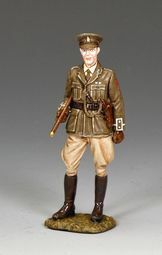 George joined the Army on the day war was declared on Germany in 1914.Although lacking any clear military skills, competence or authority as an officer, his upper-class social status and educational background meant he was commissioned immediately with virtually no military training.Among Lieutenant George’s many saving graces… He is always cheerful, exceedingly ‘keen’, generally kind, an inveterate optimist and filled to the brim with the public school ‘tally-ho’ attitude to the horrors of war and death.Superbly played by Hugh Laurie, (later of ‘House’ fame) he is the perfect addition to the ‘Blackadder Goes Forth’ collection! Hong Kong from its earliest days has been (and is) one of the great trading ports of the world. As such it relies on a veritable army of laborers to transport goods, products and everyday essentials around the city 24 hours a day 365 days a year… Today, of course, that’s mostly done by vehicle but back in the days of ‘Old Hong Kong’ these tasks were performed by legions of “Coolies” of all shapes, sizes and ages. Here is one such figure. 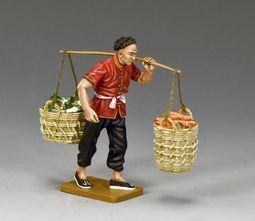 HK267M The Vegetable Coolie – In days of long ago there were hundreds of small, independently owned farms all over Hong Kong, Kowloon and the New Territories.Most of the fruit and vegetables consumed in the Colony were grown on these farms and transported on foot by ‘Coolies’ such as this man directly to local markets.Work could be back-breaking and long (at least 12 hours-a-day) but at least it kept you fed! One of Charles Dickens most famous literary creations was Mr. Wilkins Micawber, a fictional character in his 1850 novel, ‘DAVID COPPERFIELD’. 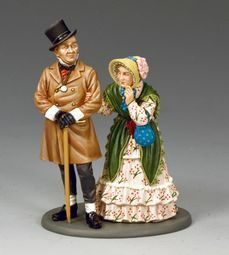 He was modelled on the author’s real father, John Dickens, who like Micawber was put into the ‘Debtors Prison’ after failing to meet his creditors’ demands. 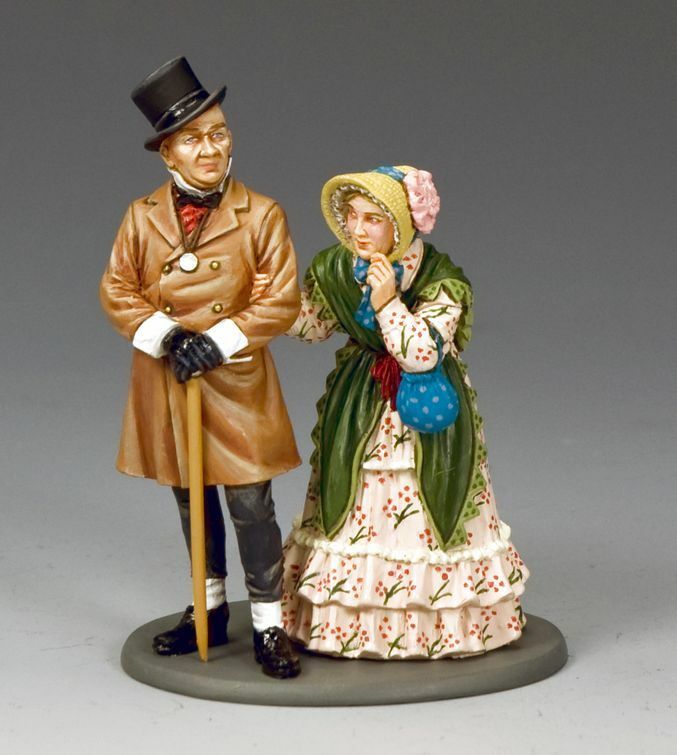 Here we see the nattily attired Micawber in the company of his long-suffering spouse, Emily. There are many legends surrounding the events that led Arthur to become King and to eventually establish his castle at Camelot and to form his ‘Knights of the Round Table’. One of the greatest is Arthur drawing the sword from an unyielding stone thus proving his suitability to become King. In some tales he is still a young boy… In others a Knight’s squire… In another version he is the Knight himself! Here, Arthur stands four-square behind the sword in the stone, his hands resting on its hilt… He is about to draw the sword out and be acclaimed… King! MK166 Brother-In-Arms – Among the priests who journeyed to ‘The Holy Land’ there were some who in their previous lives, before taking their vows, had been fighting men themselves … even some Knights.This ‘Brother’, from a humble religious order may have taken his vows some time before but he has forgotten none of his military training and skills… Sword in one hand, hand-made cross in the other he is ready to do battle. 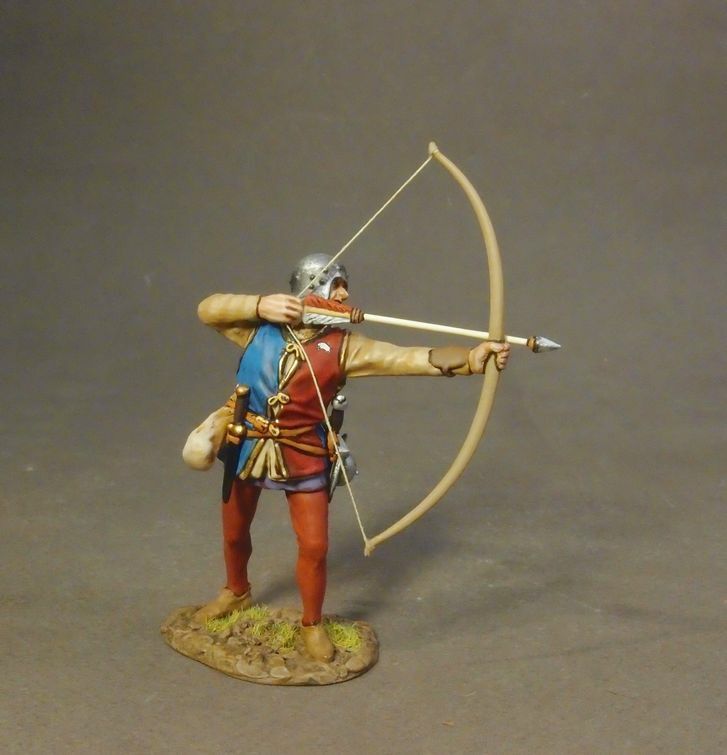 MK167 Knight Standing Ready – This warrior may look casually-relaxed but he is also ready at a moment’s notice to cut his enemy down.Great house, castles and noblemen have always had the requirement for additional professional roving Men-at-Arms. 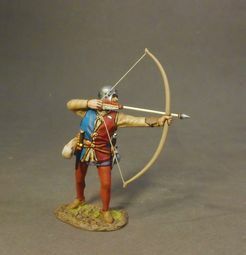 Travelling bands of mercenary soldiers would often be hired by nobles and great houses to provide extra protection and security.As such they would be dressed in the colours and livery of their ‘master’ or household… as this fellow and his fighting comrades are. MK168 Knight About to Strike – With his large long Norman-style shield protecting the length of his body this fighting Knight is about to strike a deadly blow! MK169 Knight Fighting Double-Handed – One hand is good… two even better to grip your sword handle and ‘parry’ an aggressive enemy. RH032 Brother-In-Arms (Nottingham Castle) – As those taking ‘Holy Vows’ had, at least, a fair modicum of education and intelligence they were, in addition to their military duties often given the task of tax collecting… record keeping and even educating their ruler’s young sons. RH033 The Sherriffs Man… At The Ready – The same pose as MK167 but somehow more threatening… He is, after all, one of the Sherriff’s ‘enforcers’. ROM023 Roman Soldier Throwing Pilum – Holding his shield to the front this Legionary prepares to throw his ‘Pilum’ at the enemy. ROM024 Roman Soldier Kneeling w/Pilum – Preparing to repel an enemy assault this kneeling Legionary has ample protection behind his shield with the ‘Pilum’ sitting forward at a 45∘angle. ROM027 Marching on Guard Duty – On duty inside his Roman Fort or perhaps pacing along the raised walkway behind the fort’s walls this soldiers has no need of a large shield… but he still has his sword and ‘Pilum’. This is K&C’s Third ‘landing’ of U.S. Marine ‘Leathernecks’ in action. Our first 2 x releases, back in the late 1990’s and 2005 focused on the epic battle of IWD JIMA, immortalized in both countless books and several major motion pictures. This time we are producing a ‘prequel’, a battle that was, in its own way, just as bloody and bitterly fought… TARAWA. The Battle of TARAWA was fought between 20-23 November 1943 and was part of the U.S. invasion of the Gilbert Islands in the central Pacific region. Although not the first time U.S. forces had met the Japanese in battle it was the first time they had faced serious opposition to an amphibious landing. On the tiny Tarawa Atoll more than 4,500 Japanese defenders were well-supplied and expertly dug-in and fought virtually to the last man. Opposing them were the men of the 2nd Marine Division, U.S.M.C., some of America’s toughest and best fighting forces. Of approximately 12,000 Marines who assaulted Tarawa 3,146 became casualties with almost 1,000 killed and over 2,000 wounded. That was the deadly toll of just 76 hours of bloody, brutal, non-stop combat. K&C are proud to launch an initial first wave of 7 fighting Marines in dramatic, dynamic action poses many more are on the way including a magnificent looking LVT(A)-1 ‘Alligator’. All of our ‘Leathernecks’ have shed their backpacks and are equipped with a mixture of weapons… the M1 ‘Garand’ rifle, the Thompson SubMachine Gun the M1 Carbine, the 1911 Colt Automatic Pistol and a Flame Thrower. USMC011 Marine Flame Thrower – The ‘M2 Flamethrower’ was the U.S. made, man-portable backpack flamethrower used in WW2.Although its ‘burn-time’ was just 7 seconds and its range a mere 20-40 yards it was a very useful weapon… especially in close-quarter battle situations such as the ‘island-hopping’ campaign in the Pacific during WW2.The Marines used it extensively against pill-boxes, bunkers and trenches defended by determined, die-hard Japanese. USMC012 Marine Radioman – As this kneeling Marine operator receives instructions on his ‘SCR-300’ portable radio transmitter he cradles his M1Carbine next to him. This back-packed radio was the first to be nicknamed a ‘Walkie-Talkie’. USMC013 Marine Officer w/Tommy Gun – This junior officer is barking out orders as he holds his ‘Tommy Gun’… He also carries a side-arm… The 1911 Colt Automatic Pistol. USMC014 Marine Firing his Garand – The U.S.M.C. has always believed that first and foremost every Marine must also be a ‘Marine Rifleman’. Great value has always been placed on ‘skill and marksmanship’ in the Corps and, in WW2, that was immeasurably assisted by the M1’Garand’ Rifle.A.30 caliber, semi automatic rifle it weighed 9.5 pounds was gas-operated with a rotating bolt, had an effective firing range of 500 yards and was loaded with an 8-round clip. Tough, reliable and accurate it was a Marine’s best friend! Our standing Marine fires off a few rounds at the enemy. 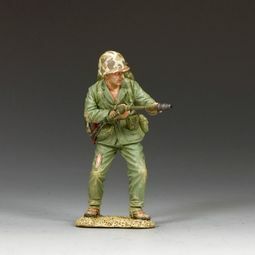 USMC015 Marine Grenadier – Holding his M1 ‘Garand’ in one hand, this ‘Leatherneck’ expertly pitches his MK2 Grenade at the opposing Japs.In appearance the Mk2 Grenade had a series of grooves and knobs cast in its casing that gave it the appearance of a ‘Pineapple’. Naturally, that soon became its nickname. USMC016 No Marine Left Behind – A badly wounded, unconscious Marine is dragged to safety by one of his buddies.Whenever possible Marines will always try to rescue a wounded fellow Marine or at least recover his body. There is a strong tradition in the Corps that whenever or wherever Marines are in battle they will always do their level best (and more) to recover their dead and wounded. From battles in the PTO (Pacific Theatre of Operations) to other battles elsewhere… In the ETO (European Theatre of Operations) and one particular operation… to save the lone surviving brother of a family called RYAN. FoB098 The Refugee Horse & Cart – A wooden, 2-wheel cart is loaded up with the bare essentials as well as a few, treasured family heirlooms… The family horse is between the shafts to hopefully pull the cart and its owner out of harm’s way. FOB099 — Refugee Mother & Son – Carrying a suitcase in one hand this refugee leads her tired old horse and its heavy load down the road. FoB-S02 Refugees On The Road – Combine the horse, the cart and the woman… and you can save yourself a few dollars! NA390 Bicorne Grenadier Advancing – Not all of the ‘Old Guard’ wore their famous ‘bearskins’ at the battle… During the ‘100 Days’ Campaign there were many supply shortages and even some of the ‘Old Guard’ were affected.Although he may have lost his ‘Bearskin’ cap… he has not lost any of his fighting spirit. NA393 Wounded Guardsman Shoulder Arms – This Grenadier has suffered a headwound but still advances forward. 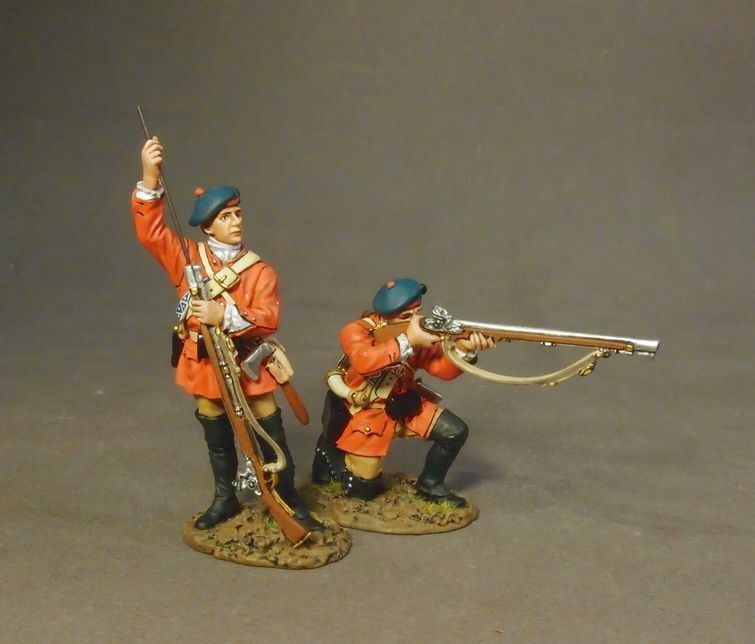 NA394 Bicorne Grenadier Firing Musket – Another of the Guard, wearing his great coat and the bicorne cap taking aim at the enemy. NA396 Saving His Officer – An ‘Old Guard’ sergeant attempts to pull his seriously wounded officer to safety. These 2 x figures were inspired by a painting showing the same action. 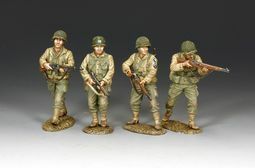 NA-S06 Blood, Mud & Dust – The complete 5 x figure set featuring ALL of the above figures at a very affordable and fair price! AK116 Pz. Kpfw. 35R(F) Self-Propelled Gun – Mounted on the tracked chassis of captured French Renault tanks these small SPG’s make a fine addition for Rommel’s Afrika Korps.This particular model mounts a 4.7cm anti tank gun in an open armoured turret to become a tank destroyer… Some were used during “Operation Barbarossa” – the Invasion of Russia in 1941. A few even saw action in Normandy in June 1944. AK117 Panzerjager 1 – Another old favorite but this time with the distinctive 2-colour camo. 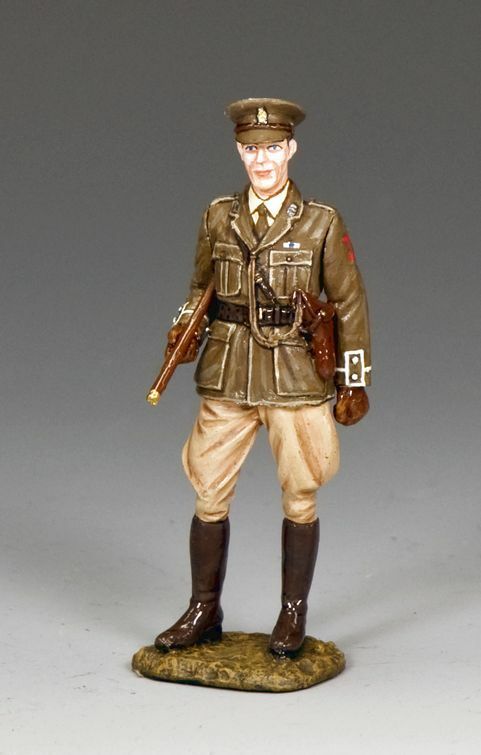 This set also includes the relaxing Afrika Korps figure. New First Legion Expected September!